There are many ways you can increase the property value of your home in the event that you ever want to put your home on the market. From small remodeling jobs to full-on rebuilding, there are many components that can double the value of your home. Below are a few ways that you can increase the property value of your home. The outside of your home is a big contributor to the overall value of your home. Make sure to always prune, limb and landscape to keep your yard looking as beautiful as the inside of your home. Another often overlooked element of the home is the front door. Having a welcoming and beautiful door is the first step in helping increase the property value of your home. Little details like this are the most often overlooked. Flooring is a huge factor in determining the property value of a home. The type of flooring throughout your house can raise the value of your home by thousands. Hardwood flooring is an extremely popular flooring style that is coveted by many potential homebuyers. Because of this, hardwood flooring is known to increase the value of your home. Of course, other flooring styles like tile and even carpet can raise the value of your home as well. If you want to install a floor that holds value, the perfect choice is hardwood flooring, as hardwood flooring is timeless and doesn’t go out of style. Be sure to properly care for your floors to help them hold their value. Using neutral colors throughout your house helps ensure a higher property value. Neutral colors allow buyers to be able to envision what they can do with the room, without being distracted by loud or abrasive colors. Keeping color schemes toned-down helps maintain a timeless and elegant aesthetic that can appeal to everyone. From leaky faucets to creaking floor boards, it’s important to perform maintenance on every part of your home to help increase its value. Regular maintenance ensures your home will hold its current property value as well as even raise the overall value of your home. When it comes to maintaining the overall integrity of your home, it’s important to pay close attention to every element of the home, from flooring to the front door. 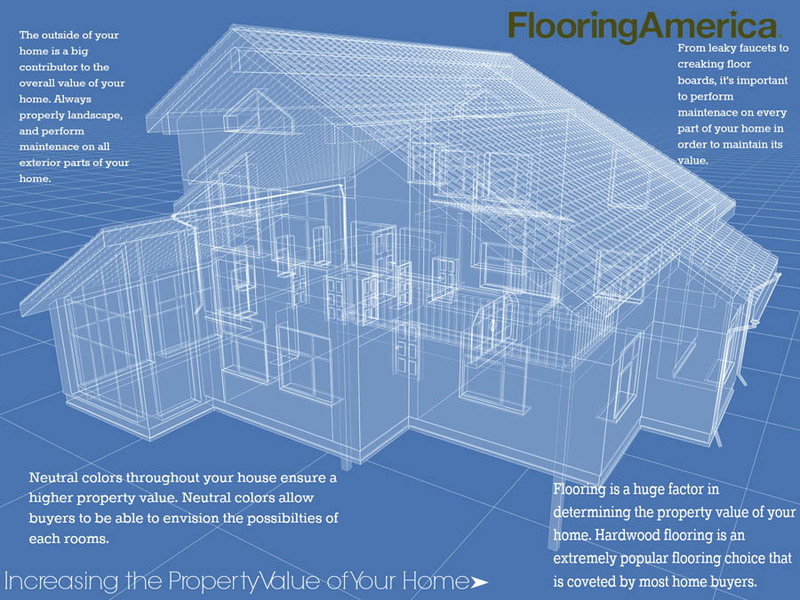 If you’re looking to increase the property value of your home, choose Flooring America for amazing floor selections! From carpet to hardwood, we have the flooring needed to make great improvements to the overall look of your home.